For over 25 years, Apex International has been committed to serving the printing industry through innovation. Now the world’s largest anilox solutions provider offers these benefits as part of our commitment to technical innovation and the development of the most consistent anilox solutions on the market today. At Apex, our brand is about values. And what we’re about isn’t making anilox rolls for printing machines, although we do that well. Better than almost anybody in some cases. But Apex is about something more than that. We believe that people with a commitment to innovation and quality can change our industry for the better. We’ve had the opportunity to work with some of the most talented individuals and organizations in the industry. We believe that people who think outside the box enough to think they can change the industry are the ones that actually do. We wanted to find a way to communicate this and what we have is something that we are very excited about. 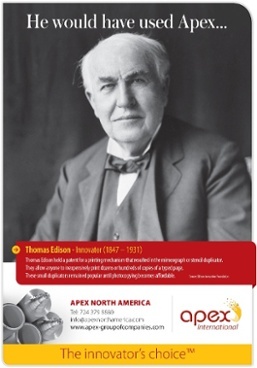 It honors those people who have shaped the printing industry. The theme of this campaign is “The Innovator’s Choice.” It’s honoring the people who, through innovation, molded and shaped the industry that we are all a part of. It is what we are about and it touches the soul of our company.